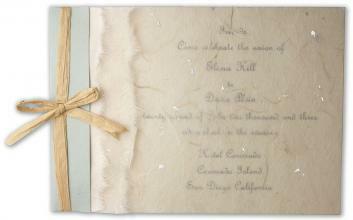 *** DISCONTINUED FOR 2009** A natural and romantic invitation for a Rustic, Seaside or Green Wedding party. Tree-free and recycled papers. DIY Invitation with silver accents. Organic, multi-layer landscape invitation bound on one side with paper raffia. Top layer of natural, mulberry paper is flecked with silver. Invitation is printed on a sheet of natural sugarcane paper. Binding cover of pale blue-green Japanese grass paper folds around a simple card stock, creating an invitation that is sturdy in the hand. RSVP enclosures and map neatly tuck inside. This invitation comes with complete instructions, but it does require more assembly skills than some of our other designs. Not difficult, but requires multiple steps. Binding Sheet:Pale blue-green handmade paper - scored for folding. Top Sheet: Natural mulberry with flecks of silver. Mounting Cardstock:natural 100% postconsumer recycled cardstock. Mailing Envelope:Natural 100% postconsumer recycled opaque A7 envelope. Tissue Liner:mulberry and silver flecks. Tool: Gluesticks, awl, brush, and holepunch.